Yes. 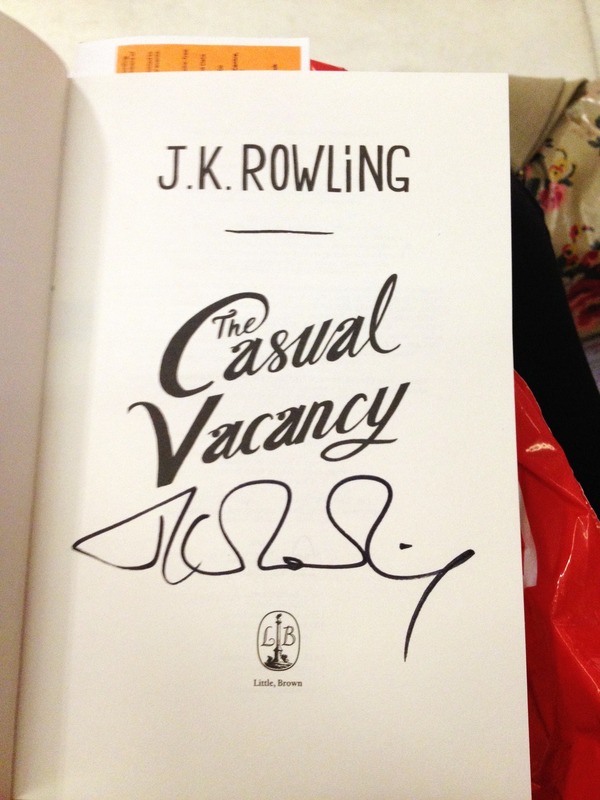 This really is my very own copy of The Casual Vacancy signed by the legend that is J.K. Rowling. Well, I was lucky enough to get the chance to go and see Jo speaking about her first adult novel at the Southbank Centre on Thursday 27th September, and she was brilliant. She talked about her obsession with death and said that if she wrote Harry Potter again, she would still kill all the same characters. But she also said that, despite still being afraid of leaving her children behind when she dies, writing about the subject has helped her become a lot less scared about the mystery beyond the grave. Jo told the audience that if she could change one thing in Harry Potter, it would be Sirius’ Mirror. Her favourite character is Dumbledore. And she didn’t intentionally rhyme the names of characters in The Casual Vacancy with characters in Harry Potter. Barry and Robbie where the names she was referring to. Jo said that she called the boy Robbie because she thought that his mum would be the kind of person that likes Robbie Williams. Jo said that she has tried to avoid reading the reviews of The Casual Vacancy, because she’s happy with the final result and it’s just how she wanted the book to be, instead, she had spent the day avoiding journalists and watching Men In Black 3 with her family in their hotel room. It made me giggle when Jo revealed that she has upgraded from a train, where the inspiration for Harry Potter first hit her, to a plane, where she came up with the idea of The Casual Vacancy. She thinks that she needs to be on some sort of moving vehicle to come up with the best ideas. I still find it incredible that one woman’s brain came up with a world that has captured so many people’s hearts, and inspired millions.